Have had a busy Monday morning. Just got back home. Eventually I will get caught up on all notifications. It was very cold earlier but now the sun is shining and it is a gorgeous day. I finally had an MRI on both knees today. So we will see in a few days the results. Also had other errands to run and things to pick up while I was out. Had a quick lunch at long John's Silver's seafood. It was ok, something different. 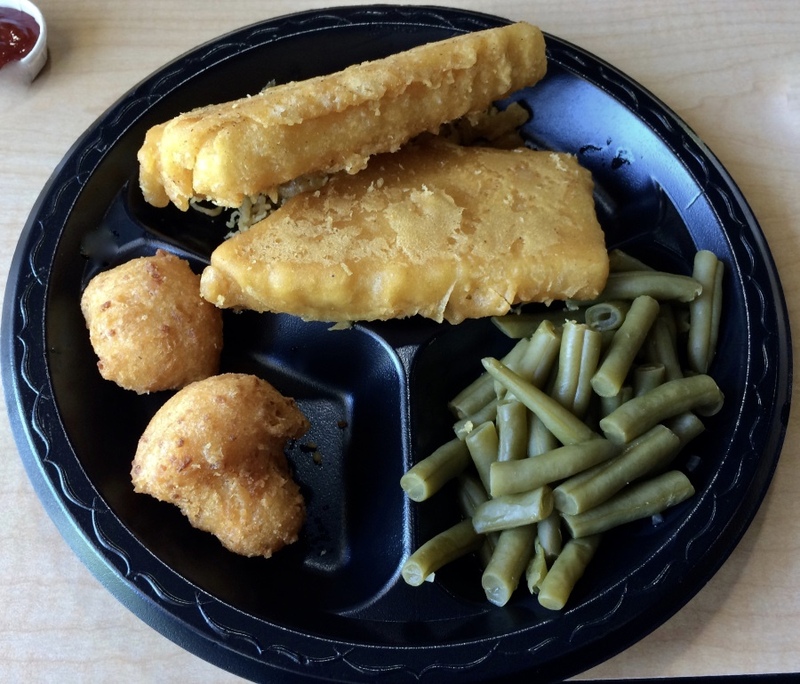 Had the white fish patty basket (in the photo) with green beans and hush puppies. It was too much to eat as the fish was really thick. I brought one piece home to have later. How is your Monday going? Having a good week so far? the weather is raining.No walks.Trying to get out of this mood that I am in. Oh you have rain. Sorry. It will get better soon. Feel better and know this too shall pass. @amadeo They called it white fish. I'm glad you had the MRI and hopefully, good news will come along with the results. I had fish for dinner Friday and Saturday nights and porterhouse last night. Chicken tonight! Thanks, me too. Sounds good. We had rain the last few days and storms but finally a sunshine day. I love seafood and wish I could get fresh but I take what I can get. I love green beans at home, with bacon. But like I said, this was a quick lunch. @CarolDM We have fresh fish here but I also opt for fillets, these are fish fillets right? @LowRiderX Yes these are fillets. I like fried fish, I prefer to have French fries with the white fish, I like the hush puppies with catfish. I was trying not have everything fried, so I chose the beans. @CarolDM I would not also have both fries and hush puppies. I hope the results will be good. It really looks delicious. Thank you so much. I hope so as well. This was great food. @CarolDM I'm glad you enjoyed the food? We don't have many around but I saw this one and stopped. Thanks. @kobesbuddy Yes I would really like some fresh seafood. Yummy lunch! I'm hungry again. What are hush puppies? @CarolDM There are a brand of shoes known as hush puppies in the UK lol. @Gillygirl Yes we have the shoes here too. Glad you got the MRIs...hope you'll get a good report. It's beautiful here in eastern NC today. My husband got an injection in his back this morning for leg pain, so that will help him. Yes me too, I finally said ok ok, I will have it, the pain is still here five weeks later. But he also told me with pulled ligaments it could take months. I said... NO!! But we will see. Hopefully your husband will be better. @CarolDM Thanks, the shots help. Hope you'll heal really fast after all you've been through! @1creekgirl Thank you, I will be fine eventually. What are hush puppies? I thought they were shoes. Funny, I just wrote a post about them. We have the shoes here in the US, but these are fried cornbread. @jaboUK You are so very welcome my friend. Any time! That looks delicious and also healthy Carol. What a nice meal you had, I hope you enjoyed it. Well it was fried so not so healthy, but delicious. Thanks! I went out with my sister to the town.I love fish and chips. Yes I love them as well. The delicacies that you showed in the picture are one of my favourites.... yum. Thanks and it was great. Monday was our new year. Some of the shops invited us at the evening to distribute their packets of sweets. We went to the shop and purchased one mosquito net for us, two single bed sheets for in laws , one bed sheet for the sofa to cover and one for my mum dad's anniversary on 4th May. Happy New Year! That sounds like a good day. I just wrote about them... fried cornbread. That fish looks chunky! Though I'd love that wedged in between bread slices and slathered with maybe mustard and mayo. :) Weekend was okay. Had a long drive to the capital. We're all just resting and taking it slow now that it's the Holy Week. Yes it as a fish steak. More than I could eat for sure. It's drizzling rain here so a good day to do a few things inside. I have lots to do inside and out. Nice day today. Thank you Maria, I will know soon. You take care too. Fish is always tasty. I like the Applebees fish and chips. Today was the last official tax season day, so we will slow down some. Yes, this was a quick stop. Glad you will be slowing down some. Yes it was deep fried. Ha1 Well fried mushrooms are good too.